We demand justice and accountability from corporations and our government for their abuses and threats to our lives. WE ARE THE 99% and we demand change! Many of us are in poverty with no prospects for living wage jobs, health care or affordable housing. The government safety net that was created to protect people from the turmoil of capitalism is being annihilated by self-serving politicians and corporate greed. Many other families are on the edge of poverty — just one measly paycheck away from homelessness, hunger and illness. The Occupy Michigan website has information and links to each Occupy city, plus a list of occupier needs for anyone who’d like to contribute. The occupations are more than just the people who camp out each night — they are about all of us! The occupiers bring visibility to our concerns in Michigan about home foreclosures, joblessness, poverty, food insecurity, education, poor public transportation, unaffordable health care and other universal basic needs. You can share your concerns at Occupy cities during the “General Assembly” meetings where everyone has a voice. Go to the Occupy city nearest you and make change happen! 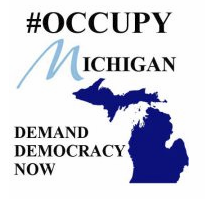 Be the first to comment on "Occupy movement takes off in Michigan"